Disclosure: I do not have any interest in MIFA shares or bonds and I do not plan to invest, neither long nor short. This is a “for education purposes” analysis only..
MIFA is a German based manufacturer of bicycles. I had actually included them into the peer group when I looked at Accell, the Dutch bicycle company some time ago. The company went public in 2004. Its largest shareholders are the CEO (24%) and Carsten Maschmeyer, the billionaire former CEO of the controversial financial services company AWD. A few days ago, they shocked their shareholders by sending out a press release which in my opinion is among the “all time greatest” press releases ever. This net loss for the year is mainly attributable to a failure to meet sales revenue expectations during the 2013 financial year. Inventory positions were incorrectly booked in connection with the launch of a new accounting system in the second quarter 2013. The cost of materials was understated accordingly in the quarterly financial statements for the second and third quarters of 2013. As MIFA does not conduct inventory-taking during the course of the year, the company failed to identify the erroneous bookings until the preparation of the annual financial statements. So what they are saying is: Sorry, we launched a new accounting system in Q2 2013 and screwed up our accounting for those last few quarters. This sounds unprofessional but rather innocent. What I did is the following: I calculated the share of materials per quarter and then, as the bicycle business is cyclical, calculated averages per quarter. Then in a final step I subtracted the averages from the actual numbers to see the variation. The table shows clearly, that variations of +/- 5% are not unusual. Indeed, Q3 2013 looks strange as the cost of material seems to be too low. But on the other hand, Q2 looks normal (material cost above average). So the “accounting software problem” seems to have kicked in only in Q3. However the impact of that problem is far from 15 mn EUR. MIFA had around 20 mn “gross” sales. So if we assume that material costs would be average for Q3 at around 65%, then the impact of the new accounting system would have been around -1,5 mn EUR (pre tax). This is somehow less than the 15 mn loss (post tax) MIFA indicated. So we can quickly summarize at this point: The new accounting system only explains around 1,5 mn EUR loss, not 15 mn. So the question is: Where did the other 13,5 mn EUR loss come from ? Let’s have a quick look at their inventory levels. This table shows per quarter the inventory level divided by 12 months trailing sales. Then in a second step, in order to eliminate the seasonal effect, I calculate the change per quarter from a year ago. As one can easily see, something seems to have changed in the second quarter 2012. Inventory levels went up and never came down. And just for reference: Accell manages to work with inventory levels of around 30% per year-end, half of what MIFA is showing. What also seems to be a strange coincidence is the fact, that MIFA stopped to break down inventory in their 2013 quarterly reports. Before, they would split it out in finished but not sold products etc, whereas from Q1 2013 we only get one line for total inventory. A large inventory in my opinion is a big problem for a bicycle companies. Mostly, they renew their models annually. Full prices are only paid by customer in spring time, the later in the year the higher the discounts.Especially with Ebikes and their components, which improve a lot over the annual cycle, old stuff will require large discounts to sell them. Finally a last look on the relationship actual sales vs. produced but not sold. Normally, due to the seasonality, MIFA would build up inventory (i.e. produce more than they sell) in Q4 and Q1 and then sell more than they produce in spring/summer (Q2 and Q3). This table shows us that they had the usual inventory build up in Q4 2011 and Q1 2012 but that they failed to sell this in 2012. We then see a huge inventory build up again in Q1 2013 (on top of the large base). Then there was some selling again in Q2 2013, but the really strange thing is the inventory build up in Q3 2013. So again, this underlines the impression that the problems started already in 2012 and that most likely the inventory is much to high. When I quoted the press release above, I left out a few passages. Mr. Wicht is currently unavailable to the company due to illness. Mr. Wicht was the long time CEo and 24% owner. That he just dissapeared is not a good sign. in the bond and credit facility terms cannot be complied with in the 2013 financial year. This might result in a special right of cancellation for the respective investors. If this were to occur, the company plans to convene a bondholders’ meeting to coordinate a corresponding amendment to the bond terms. The company would also examine other refinancing options in such an instance. Oh oh, covenant breach, this does not sound very promising. I am pretty sure, bondholders and banks will not consent to anything, unless additional (dilutive) equity wil be injected. MIFA has made significant progress with its planned strategic partnership with Indian company HERO Cycles Ltd. (“HERO”). MIFA has signed a letter of intent with HERO that comprises a EUR 15 million investment by HERO. Further details relating to the transaction are subject to final due diligence, and to agreements where the parties are in advanced negotiations. Besides an equity investment, the strategic partnership includes an extensive cooperation venture between MIFA and HERO in the purchasing and product purchasing areas, especially in the case of electric bikes and motors. Legally-binding agreements with HERO are expected within the next few weeks. In terms of revenue, HERO is the world’s largest bicycle manufacturer. 1. In technical terms, a letter of intent has no legal implications. Hero Cycle can walk away at any time if they don’t like the terms. 2. According to this report, Hery Cycles had sales of 1.450 “Crores” Indian rupees. One crore is 10 million so we are talking abot 14.5 bn Indian rupees of sales. Sounds like a lot, but with a 60:1 INR/USD exchange rate, we are talking only about 240 mn USD annual sales. So in terms of revenue, Hero Cycles is only around 60% the size of Accell. And the largest bicycle manufacturer in the world by sales is Giant from Taiwan with 1.8 bn sales or 7,5 times the sales of Hero cycles. So the claim that Hero is the largest bicycle manufacturer is clearly wrong and in my opinion could be interpreted as misleading investors believing that there is a “deep pocket” Indian investor, whereas in reality, Hery cycles is only a relatively small company selling lots of ultracheap bicycles. If I calculated correctly, they are selling ~5 mn bicycles in India per year which results in an average selling price 44 USD per bicycle. I just found this link with the 2014 line up of Hero. Most of the models indeed are in the 40-50 USD per bicycle range. And by the way, the bicycle business in India doesn’t seem to be so great either at the moment. And for the avoidance of doubt: Hery Cycles IS NOT part of the much bigger Hero Motor group. They do have the same founder but split up a few years ago. I do not claim to really understand what MIFA was doing and I have no idea if they will survive or not. However, just by looking at their historical material costs and inventory level, it seems unlikely that the newly introduced accounting system could be responsible for a 15 mn loss. For me it is much more likely that the inventory build up at least since mid 2012 lead to overstated results over a longer period of time. The 15 mn loss announced seems to contain a significant write down on inventory as well. I could imagine that they might have to restate older financial statements as well. For someone analyzing MIFA in detail, it would not have been that hard to see that something was going really wrong. Drastically increasing inventory levels in a seasonal business are always a really bad sign, at least as bad as increasing receivables. For the shareholders and bond holders, there is still the hope that Hero Cycles from India might be the much needed saviour, although the false claims made in the press release should make one suspicious and I highly doubt that those guys have such “deep pockets”. Let’s wait and see but this will not be easy for MIFA. Vetropack just released 2013 numbers and the annual report yesterday. All in all, things don’t look so great. Sales increased 2%, however EBIT margins declined and net income declined significantly as the one-off gain from a property sale in 2012 could not be repeated. EPS (undiluted) was 137 CHF per share. A quick reminder here: Vetropack reports in CHF but the majority of sales are non-CHF. In 2013, the Swiss frank depreciated against the EUR, so all things equal, even with constant EUR sales, Vetropack would show increasing CHF sales. The biggest problem for Vetropack is clearly Ukraine, where they had ~15% of sales in 2013. They do not provide profits for their subsidiaries, so we do not know which margins come from what country. But clearly, with the currency devaluation (~-50% since the beginning of the year), in the best case, sales from Ukraine (and profits) will be -50% lower in 2014 than in 2013 just from the currency effect. Looking into the 2013 annual report, we can see that most other subsidiaries are stagnating or only growing very slowly. interestingly, if we compare 2013 with the 2008 report, we can see that especially Switzerland has disappointed, with sales now -20% lower in 2013 than in 2008. Somehow, the increase int he Swiss franc seems to have been a big problem. All in all, things don’t look very good. This is reflected also in the current valuation. At the current share price of ~1570 CHF, P/B is almost exactly 1, trailing P/E 11,4 and the dividend ~2,4%. The only bright side was that cashflow looked rather OK in 2013. Operating CF of around 100 mn CHF minus Capex of 50 mn is ~50 mn free cash flow which has been distributed to shareholder to a large extent via divdends and teh stock repurchase last year. Net cash went down but this seems to be the result of a “Non core” purchase of a real estate company which came with some real estate loans (note 26 annual report). I would therefore exclude the 20 mn real estate debt from EV as the acquired assets are “extra assets”, not required to run the business. This was based on 150 CHF free cash flow per share. 2013 FCF per share was around 122 CHF per share. So first mistake: Free cash flow did not increase by 3% from 150 CHF but did actually contract. Secondly, I used 8% as discount rate. As we see now, Vetropack’s regional exposure does not really warrant a lower discount rate than my simple 10%. So second mistake: The 8% discount rate was much too optimistic for a company with signficant “emerging markets” exposure. Both trade at siginficant higher valuations. Zignago at 20x trailing p/E, 8,5 EV EBITDA and 4,6x book, Vidrala at 18xP/E, 3x book and 7,8 x EV/EBITDA. MArgins are not that much higher for Zignago and Vidrala, but Return on invested capital (including debt) looks better. ROE anyway as both competitors use leverage. Both peer companies, despite being based in “PIIGS” countries managed to grow their top line better than Vetropack. Vidrala has grown sales by ~25% since 2008, Zignago by around 20%. Vetropack in comparison has grown sales (in EUR) since 2008 only by 15%, net income went down -10% vs. 2008. But: Also for Zignago, net income went down -20% since 2008, only Vidrala could actually increase net income (after a small dip in 2011 and 2012). Although they seem to do almost all of their business in crisis ridden Spain, Portugal and Italy. So Vidrala clearly shows that you can do a solid job in this business even under adverse circumstances. Although valuations look stretched for both competitors. Back to Vetropack: Starting with the current variables (1.575 CHF per share, 125 CHF FCF), I would need at a 10% discount rate ~4,5% FCF growth per annum to give me a 50% upside. This is clearly not going to happen soon. On the plus side, the downside is well protected via the (conservative) tangible book value which will most likely grow by mid single digits going forward. So at the moment, I do not see a big upside or under valuation for stock, taking into account the higher risk profile of the stock. The upside could come back, if Ukraine gets solved quickly and a lower discount rate could be justified. Another positive could be somehow lower costs but I would not rely on this. Finally, if they continue to buy back shares, then we could also see improving metrics per share but they didn’t announce anything yet. I am a little bit uncertain at the. I think I made a mistake in the beginning by using a discount rate which was too low and did not reflect the geopolitical risk profile of their subsidiaries. Now however, the Ukrainian risk seems to be priced in already to a large extent. As I am somehow more sympathetic to Emerging Markets in their currently depressed state, I am tending to keep Vetropack as a partial “Emerging markets / Ukraine bet” for the time being. However, if I would find more and better EM bets, I might sacrifice Vetropack at some point in time. Late last week, AirBerlin announced (more or less directly), among other stuff, that they plan to completely delist and transform themselves into a non traded “limited liability” company. AirBerlin is a struggling regional German Airline, where Etihad, the Arabian airline has currently a 29% stake. Ethihad seems to be eager to increase their share to slightly below 50%, above that Airberlin would be at risk to lose valuable Airport slots etc. as they would not be considered a German/European airline anymore. Normally, if you cross the threshold of 30%, you have to make a bid to all shareholders, usually related to an average price over the last 30 (or 0 ?) days or so. In this case, the plan seems to be different. Ethihad and the management seem to want to take Airberlin private. In this case the tactic seem to be to scare investors away by delisting the shares and transform then into non-tradable stakes first, and then most likely come with a lowball bid for the remaining shareholders. Funnily, the stock chart jumped shortly when the news came out but then went back down again rather quickly. Why is this possible and where is the problem ? Why did I say in the headline that this is bad news for stocks and ist shareholders ? Well, first of all, delisting a stock is definitely not a good thing for shareholders, all other things equal. Not being able to trade via an exchange means very limited liquidity. Limited liquidity or no liquidity means that holders either will require a higher discount to fair value or, as many funds etc. are not even be allowed to hold the stock and are forced to sell. While this is a bad thing for existing shareholders, it is of course a good thing for a strategic investor, who does not need any liquidity in his position and wants to buy cheap. So “conspiring” with management in order to delist a company and drive down the acquisition price would be a very obvious strategy to take over companies cheaply. In order to avoid this and protect especially small shareholders, there are usually regulations to prevent this. One case where I was directly involved last year for instance was EGIS, the Hungarian pharmaceutical company. There, the majority owner also threatened to take the company private in order to “motivate” small shareholders. But in Hungary, he would have needed at least 90% of the shareholder vote in order to do so. So he had to make a somehow fair offer at first before then being able to add his “going private” thread. This makes a huge difference. So why the hell is this so easy in Germany ? My guess is that this is a first test balloon, following to court decisions in Germany. First, in 2012, the highest German court, the “Bundesverfassungsgericht” said that the listing of a share is not explicitly protected by the German constitution. As a result of this, late last year, the highest Civil court then decided in October 2013, a delisting can be decided without asking shareholders by the management of the company alone. Until now, based on the so-called “Macrotron case”, companies had to offer a fair-value based cash compensation if the wanted to delist from the stock exchange. I am not a lawyer, but in general this decision has clearly negatively impacted the right of minority shareholders. I do not know which are the possibilities to fight against those delistings, but it seems that it has become much harder and more difficult. So going back to the EGIS example: Minority shareholders in Hungary are much better protected against this as German shareholders. Of course this is great news for M&A advisors, private equity funds or dominant shareholders etc., because it makes it easier to buy companies and kick out small shareholders at a low price. On the other hand, in the long run, valuation levels for markets almost always reflect the rights of shareholders, especially minorities. If there are no rights (see Russia) than stocks will trade at a discount. For me, this is a reason more to stay away from the rather expensive German stocks, especially if they have dominant shareholders who want to have the whole company cheaply. If the AirBerlin case would be the blueprint for similar deals to come, this would be very negative for the valuations of similar German companies. One might even think about developing a short strategy for likely candidates. And yes, squeeze out speculations do not look so attractive anymore. After starting to look into Emerging Market companies, I thought it might be a good idea to beef up my library with some books on that topic. Nevertheless, I bought the “Little book” as they are usually compact and easy to read. The book starts with the general investment principles of Mobius, which are clearly derived from value investing “Graham-style” following his mentor John Templeton. He stresses low valuations, especially with regard to tangible book and wants companies to pay out dividends. Similar to Howard Marks he deeply believes in the cyclicality of markets. Within the book there are several stories about specific markets such as Czech Republic, Kazakhstan, China, Thailand and Russia, but most of this are anecdotes, entertaining but not very instructive. He mentions some specific investments (Siam Cement, China Telecom) but overall he remains mre on the general level. 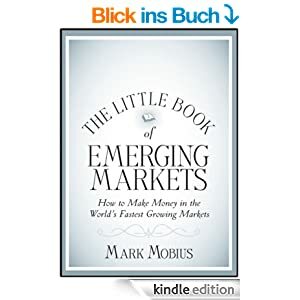 The best part in the book are the last chapters where he provides some general advice how to invest in Emerging Markets. For him, investing in Emerging Markets is Contrarian Investing. “If you see the light at the and of the tunnel, it might be already too late to invest”. “When everything else is dying to get in, get out. When everyone else is screaming to get out, get in”. Overall I liked the book as it is easy to read, although it doesn’t offer a lot of “depth” which, on the other hand, is not the goal of the “little book” series. Maybe it is a kind of “confirmation bias” from my side, but somehow the book confirmed my view that it is now a good time to dig deeper into Emerging Markets. I have to verify this but in fund management, legends are often overrated……. The Graham Holding deal – another example why only Warren BuffetT can invest like Warren BuffetT. HIGHLY RECOMENDED: I never knew that John Hempton from Bronte is actually publishing monthly letters and performance (Hat tip to Al Sting). Read all of them, for instance September 2013 on why they are short Swedish quality companies or how they got squeezed out from a crowded short. The Aleph blog has a great series on how Berkshire Hathaway is actually structured. Part 2 with the somehow dodgy trust structure has been extremely interesting. Finally, the always great Brooklyn investor with a nice analysis of DirecTV, the largest “non-BuffetT” position at Berkshire.